Turtles might not be as cuddly as cats or dogs, but they make great pets. Since they can live for decades, be sure you’re ready to make a long-term commitment before purchasing a turtle. To keep your pet happy and healthy, provide proper housing, nutrition, and good hygiene. Specific requirements vary by species, so ask the breeder or pet store about exact care instructions for your turtle. House your turtle in the largest possible enclosure. 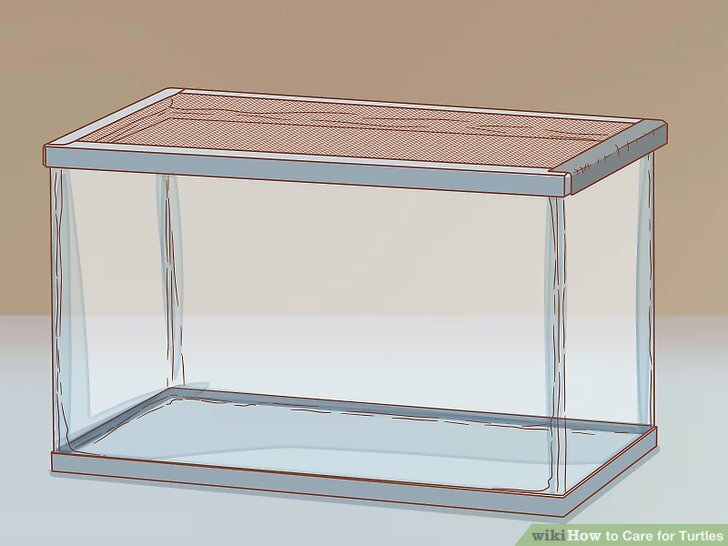 Keep your turtle in a large glass aquarium. As a rule of thumb, the enclosure’s volume should be per of your turtle’s shell length. Keep in mind your pet’s exact space requirements depend on its species. If you have a juvenile turtle, be sure to find out how large it’ll be when it’s an adult. Suppose you buy your juvenile turtle a tank. If the turtle eventually grows to , that tank will be way too small. The tank should also have a secure cover to prevent your turtle from escaping. Additionally, aquatic turtles need water deep enough to swim. The water’s depth should be at least twice the turtle’s length. Cover the bottom of the tank with peat moss or soil. Mix together equal parts of wood chips and peat moss or sand and soil. Line the bottom of the tank with about of the mixture. Avoid lining the bottom of the tank with gravel. Your turtle could eat the small rocks and choke. Make a basking area for your turtle. 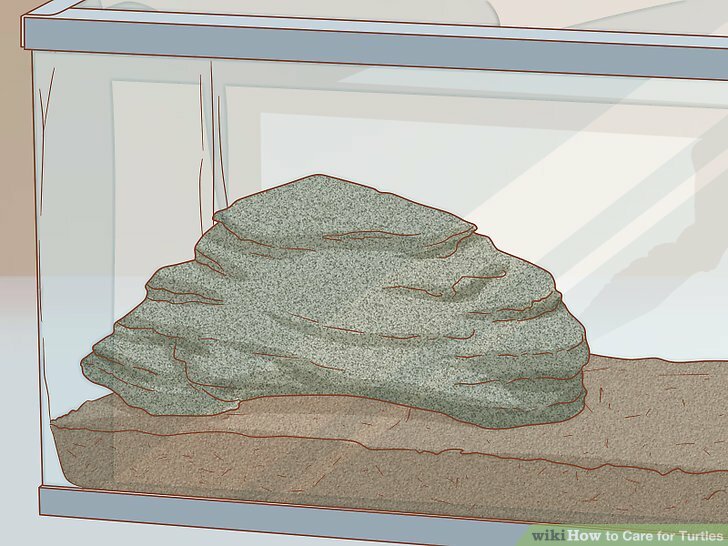 Make the layer of sand and soil or peat moss and wood chips higher on 1 side of the tank. Build up smooth, wide river rocks or driftwood onto the elevated side of the bedding. This side of the tank should stay dry and rise up out of the water. Gently slope the peat moss or soil and river rocks so the incline won’t be too steep for your turtle to climb. Get a hiding box at the pet supply store and place it in the basking area. Your turtle will appreciate having a cozy spot to hide. 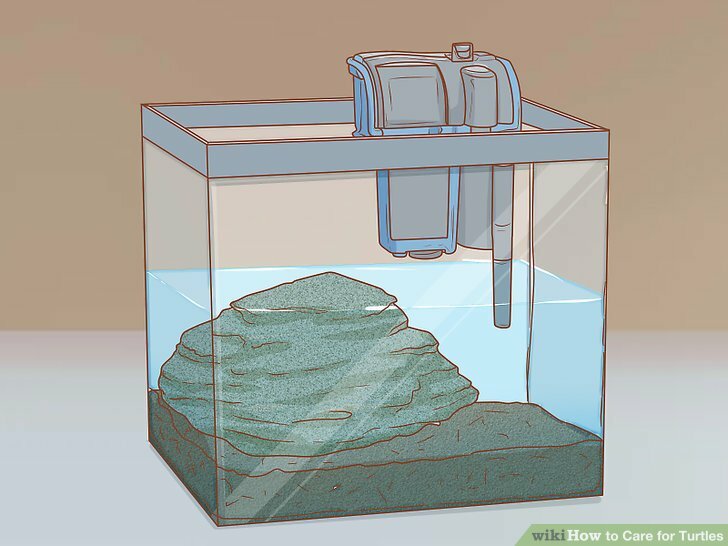 Keep in mind the water in the tank will need to be deeper if you have an aquatic turtle. Make the basking area’s height more than twice the turtle’s length to ensure it’ll be above water. Add water to the tank. You can fill the tank with tap water, provided your water doesn’t have high chlorine levels. If you have a box turtle, the water should be shallow enough that the turtle can lift its chin above the surface when it's submerged. Box turtles can drown in deeper water. If you have an aquatic species, such as a pond terrapin, remember that the water should be at least twice as deep as the turtle’s length. Find a chlorine test kit online, at a pet supply store, or at a home improvement store. If your tap water’s chlorine level is above 0, fill the tank with bottled water or purchase a dechlorinating agent at the pet supply store. Use a reptile lamp to heat the basking zone. Creating a temperature gradient with a hot side and cooler side is an important part of raising reptiles. Purchase a reptile lamp with a reflector at the pet store; make sure it’s labeled for reptiles. Keep a thermometer in the tank, and make sure the basking zone’s temperature stays between . If your reptile lamp uses an incandescent bulb, you’ll also need to buy a UVA/UVB fluorescent lamp. UV light provides your turtle with vitamin D, which helps it absorb calcium. 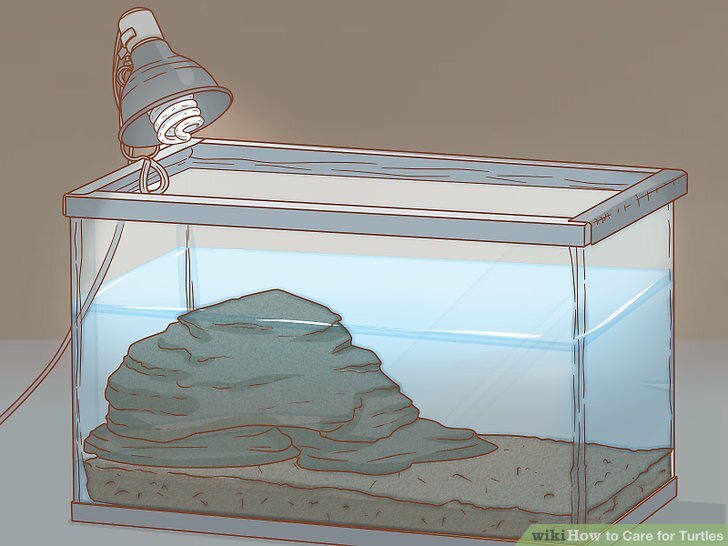 You’ll need to turn the lamp off at night, but the tank cannot cool to less than . If the tank's air and water temperatures get too cool at night, place the the tank on a heating pad and purchase a water heater at the pet store. 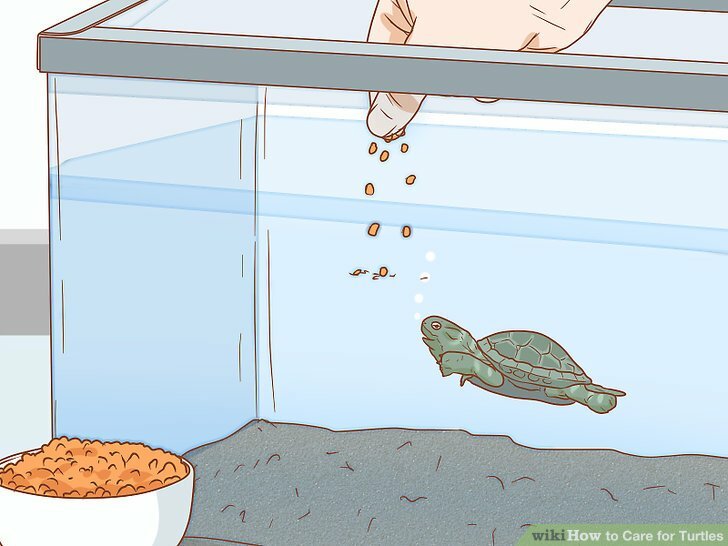 It’s wise to set up the tank at least 2 weeks before getting your turtle so you can perfect the temperature and other environmental conditions. Install a filter to help keep the water clean. Invest in a filter labeled for a volume of water at least twice that of your tank. Suppose you have an aquatic turtle, you house it in a tank, and half of the tank is filled with water. Since the tank contains about of water, go with a filter labeled for . When you’re at the pet supply store, ask an employee for advice about purchasing a filter. 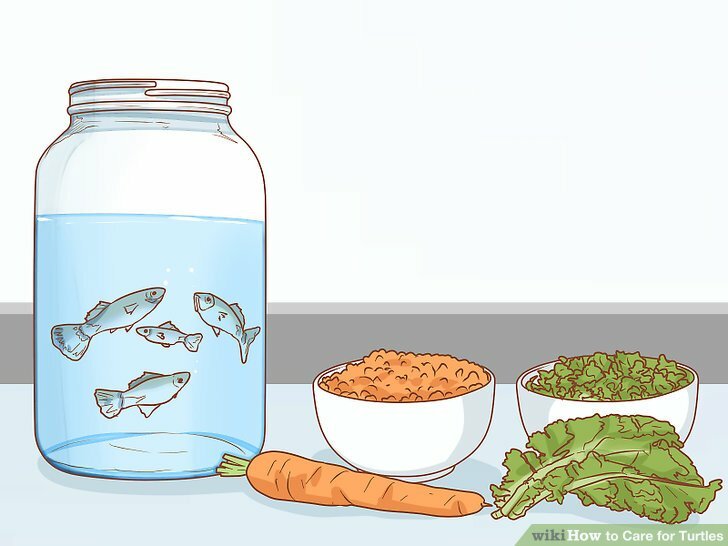 Even though you’re using a water filter, you’ll still need to remove feces and other debris from the tank with a net every day. To keep the water cleaner, feed your turtle in a separate tank. Invest in a smaller backup tank. A back-up tank will come in handy if you need to transport your turtle. 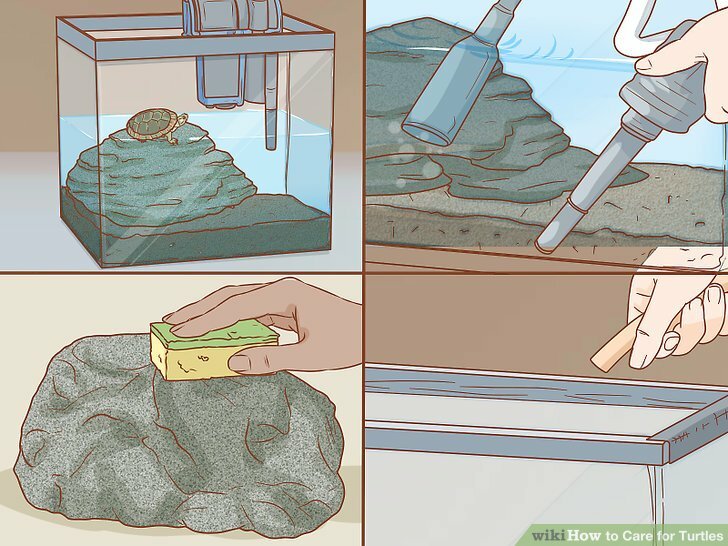 Additionally, you’ll have to clean the main tank regularly, and you’ll need a place to store your turtle in the meantime. Since it’s only for temporary use, the backup tank doesn’t have to be big. Just make sure your turtle has some room to crawl around. To keep your turtle warm, transfer the heat lamp to the backup tank when it’s in use. Purchase turtle food labeled for your pet’s species. Purchase pellets or canned turtle food at your pet supply store. Most turtles kept as pets need both animal protein and veggies. 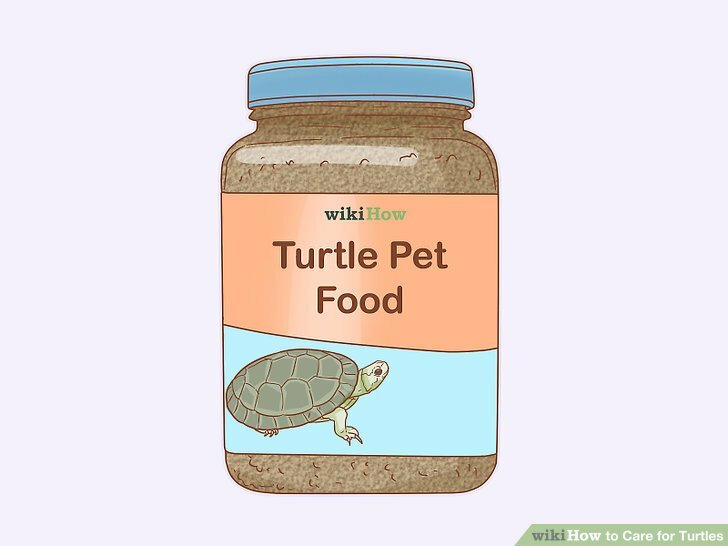 Store-bought food will provide most your turtle’s nutrition, but you should also supplement its diet to ensure it stays healthy. Supplement your turtle’s diet with fish, invertebrates, and veggies. Buy frozen and live guppies or minnows, worms, grasshoppers, and crickets. Additionally, chop up veggies, such as kale, lettuce, dandelion, and carrots, and add them to your turtle’s food. Swap up what you feed your turtle to keep its meals interesting. You could feed it store-bought food 1 to 2 times a week and homemade meals another 1 to 2 times per week. Live fish and insects can provide mental stimulation. To prevent choking, cut up veggies into bite-size pieces smaller than your turtle’s beak. Feed your turtle 3 to 4 times per week. Most turtle species commonly kept as pets need to be feed every other day, but check with the breeder or pet store to be sure. Mornings are good feeding times, since turtles are more active earlier in the day. Determining the right amount of food is a little tricky and isn’t an exact science. As a rule of thumb, give your turtle the amount of food that it can eat in 5 minutes. Observe it when you first feed it to gauge the right amount. Turtles are opportunistic eaters, and they’re prone to overeating if they have an unlimited supply of food. If you have an aquatic turtle, put its food directly in the water. Aquatic turtles can’t swallow food unless it’s in the water. After 5 minutes, scoop out any extra food with a net to help keep the water clean. Feed a box turtle with a food bowl, and remove the bowl after about 5 minutes. Add calcium to your turtle’s food every other feeding. 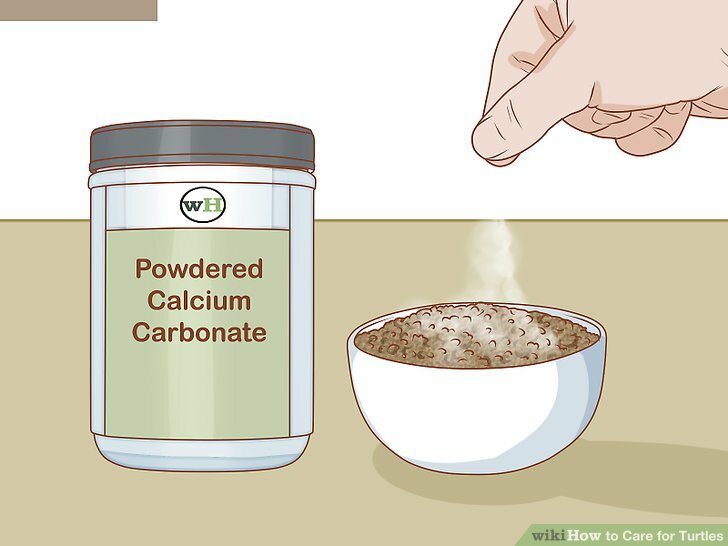 You can find powdered calcium carbonate online and at pet stores. Sprinkle a pinch onto your turtle’s food 1 to 2 times a week to ensure it meets its calcium requirement. Turtles need lots of calcium to keep their bony shells strong. If have an aquatic turtle, you can also keep a block of calcium carbonate in the water for it to chew. Check your turtle for signs of illness regularly. 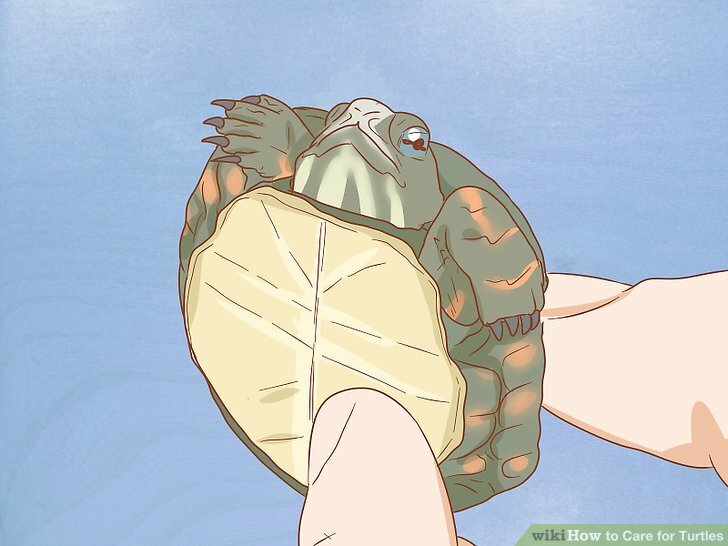 Give your turtle a quick inspection every 1 or 2 days, such as when you feed it. Make sure your turtle’s skin and shell are smooth and free of any marks, blisters, or blemishes. Check its eyes, nose, and beak for discharges or discoloration, and notice any unusual changes in behavior. Turtles are generally healthy, but they are prone to infections, malnutrition, and eye problems. If you spot concerning signs, such as a soft, leathery shell, cloudy eyes, or skin blisters, bring it to an exotic pet vet who’s experienced with treating turtles. Search online for an experienced local vet, or ask the breeder or pet store for referral. 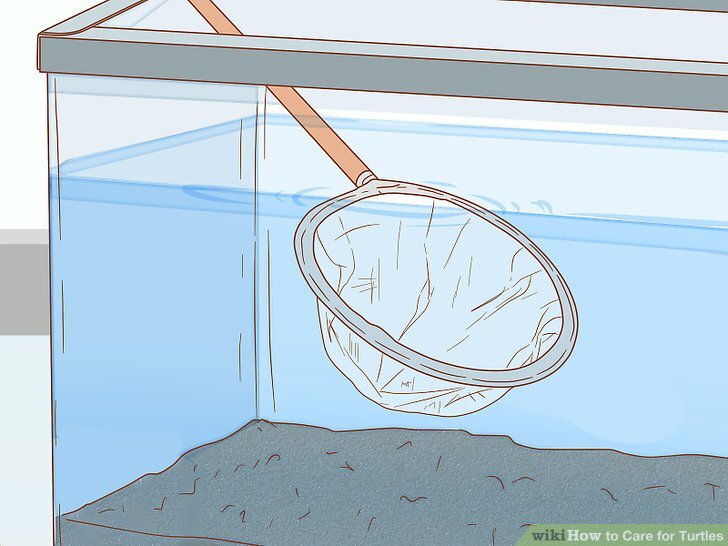 Use a net to remove droppings from the tank every day. To keep the water as clean as possible, scoop out droppings, leftover food, and other debris daily. Be sure to wash your hands after touching the inside of the tank or handling your turtle. Turtles carry salmonella, which can cause vomiting and diarrhea. 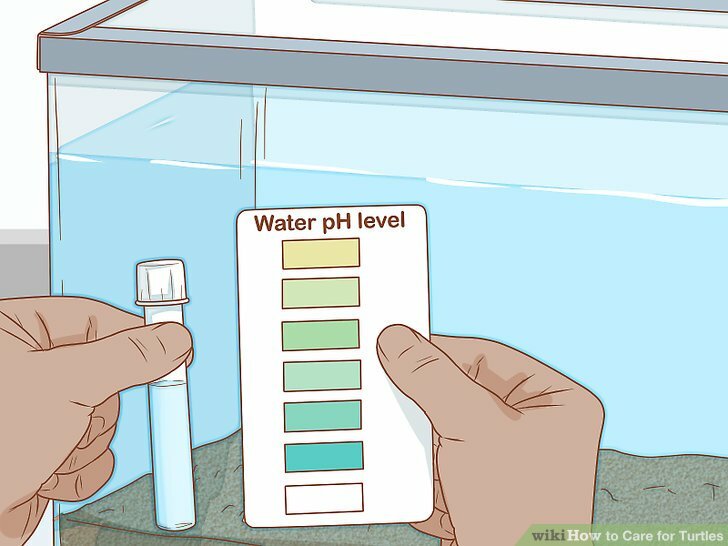 Test the water’s pH, ammonia, nitrite, and nitrate levels every few days. Get an aquarium water test kit at the pet supply store or online. Make sure the pH is between 6.0 and 8.0, or roughly pH neutral. Ammonia levels should be 0, nitrite levels should be less than 0.5 ppm (parts per million), and nitrate levels should be less than 40 ppm. Your turtle will drink the water, so it’s important to test it and keep it clean. If the pH is off, amend the water with a store-bought agent, which you can find at the pet supply store. If ammonia, nitrate, or nitrate levels are high, change the water and consider upgrading your filter. Change 25% of the aquarium’s water weekly. 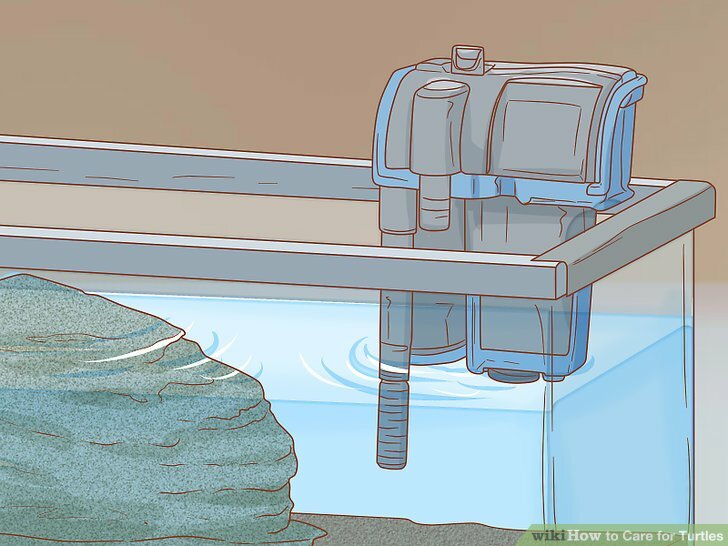 Using a bucket or siphon, drain and discard about 1/4 of the tank’s water. Then replace it with an equal amount of new water. The water contains beneficial bacteria; whenever possible, avoid changing it entirely. Clean the tank every 3 weeks. 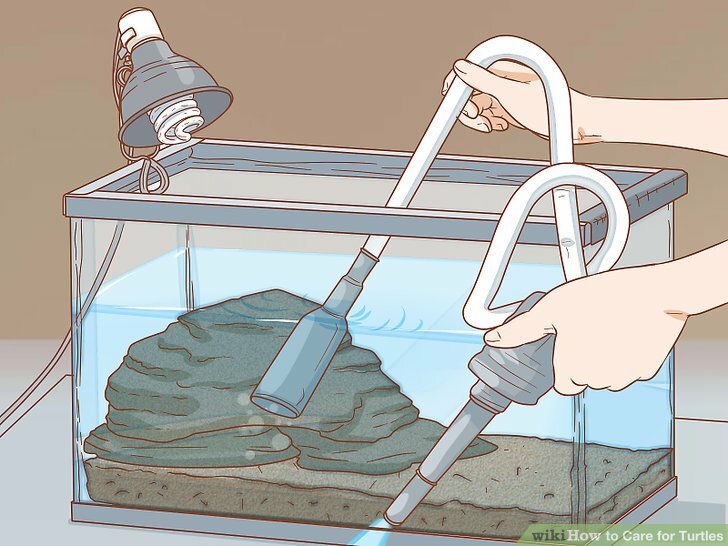 Transfer your turtle to the backup tank so you can clean the main enclosure. 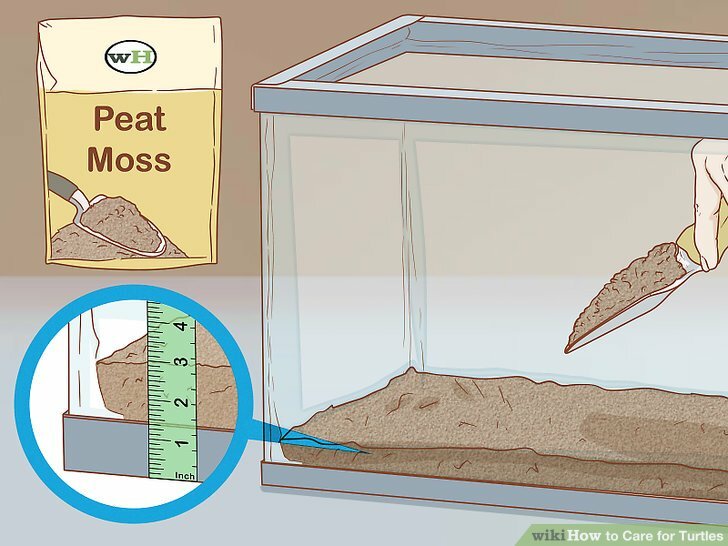 Save 1/4 to 1/2 of the water, and discard the rest along with the old peat moss or soil. 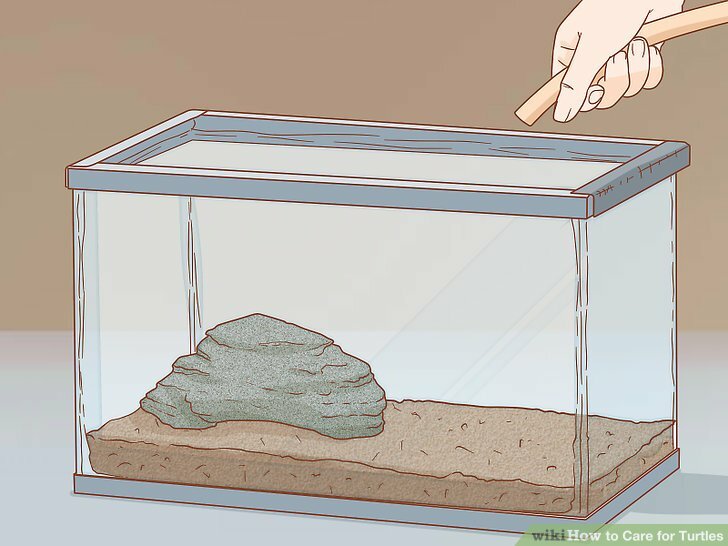 Then scrub the rocks, hide box, and inside of the tank with a solution of 1 part bleach to 10 parts warm water. Rinse the tank and accessories thoroughly, and be sure to wash away all traces of the bleach solution. After thoroughly rinsing the tank and accessories, put the habitat back together and refill it with water. Be sure to wash your hands and sanitize the sink or tub with bleach after washing the tank. Remember that turtles carry germs that can make people sick. Remember to always wash your hands after handling your turtle, touching inside of the tank, or cleaning the tank. Specific care instructions depend on your turtle’s species, so check with the breeder or pet store for your pet’s exact requirements.